Los Angeles is no stranger to failed infrastructural schemes and vanished landscapes. 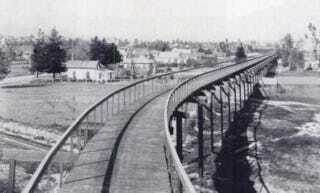 But did you know that a nine-mile bike highway once traveled part of the way from LA to the nearby city of Pasadena? It’s one of 19 map-annotated essays about the city featured in the new book LAtitudes: An Angeleno’s Atlas. On Monday we heard from author Dan Koeppel, who traced the path of what was known as the California Cycleway, until it was abandoned in the early 1900s. Today from 3-4 pm EDT, Dan and LAtitudes’ editor Patricia Wakida will be here answering your questions about the failed bike highway and how the book uses geotagged stories to tell 18 more tales about LA. How does one go about mapping a century-old piece of infrastructure that’s all but vanished? And why is cartography a great way to talk about urban history? I asked Dan and Patricia a few questions to get the conversation started. Gizmodo: Dan, how did you first find out about the California Cycleway and what made you want to write about it? Dan Koeppel: I’d heard about it years ago when there were discussions on extending the Arroyo Seco Bike Path [along the same route]; there was also (briefly) a Cycleway coffee shop in Hermon—along the route—that had some gorgeous photos of the constructed segment on display. But I got really fascinated when, as part of my other walking projects, I found the old maps listing the cycleway, and tried to map them up to modern construction. My fascination was enhanced by my participation in a documentary—Fredrick Gertten’s Bikes vs. Cars—in which I talk about my Cycleway findings; that documentary just premiered at South by Southwest, and I’ll be speaking about the Cycleway when the film screens at the Telluride Film Festival in late May. It seems like the proposed Cycleway was well-mapped at the time, how difficult was it to trace the route in today’s LA and Pasadena? Dan: Figuring out where the route was wasn’t that hard—just a lot of comparing old maps and new, then walking the streets, looking for places where they matched up. It was a lot of legwork into the archives—at the Los Angeles Public Library, the Pasadena and South Pasadena Libraries, and the Pasadena Historic Society. Of course, the hardest thing was that much of the Cycleway was absorbed into the Pasadena Freeway—so those pieces weren’t accessible or easy to overlay from the past to the present. It seems like there’s a lot of interest around this kind of mapping and storytelling. Patricia, how did you balance the use of hand-drawn analog maps like Dan mentions with the current booming digital cartography era? Patricia Wakida: Our cartographer, David Deis, who is the staff cartographer of the geography department at CSU Northridge, created the maps digitally although he depended on tracings and scans of older existing maps as well. I do believe that our maps were deliberately created not as wayfinders as much as they are visual frameworks of the many layers of stories that exist on every block of LA. Our maps also examine and trace patterns of early growth and eras of cultural booms, including how well known intersections, neighborhoods, and street names were determined. We hope that the maps and the essays awaken a sense of wonder and surprise about Los Angeles that readers had not previously experienced, at least, not from digital cartography as it exists today, although admittedly Google Maps are growing increasingly sophisticated and has great potential for layered storytelling—who hasn’t looked up their childhood home and marveled at the photography and their methods of collecting this data to build maps? Why are we so interested in mapping our own cities? Patricia: Perhaps its due to the fact that our relationship to cities and visual information are continually evolving, and in the case of Los Angeles and the civic renaissance its undergoing, this means that both resident Angelenos and visitors are reexamining how we view LA’s city streets, landmarks and buildings, parks, transit stops, sidewalks and stairs. As a newcomer to LA, I was always lost and so the work on the book coincided with my learning to navigate it, by memorizing streets and routes as well as looking how the place had been documented on paper and digitally— for any resident of a city, its always a fascinating exploration to recognize what is recorded on maps and what is left behind. Our understanding of a place, and how we emotionally map it, is colored by our past memories and our imaginations of what has happened before and hopes of what the city’s future will look like. Check out the book’s website and ask your questions for Dan and Patricia below!